Disney's BoardWalk; Photo by BigFamily TMOM, Heidi Gollub. Step back in time at Disney’s BoardWalk Inn, a charming waterfront resort hotel located within walking distance of Walt Disney World. 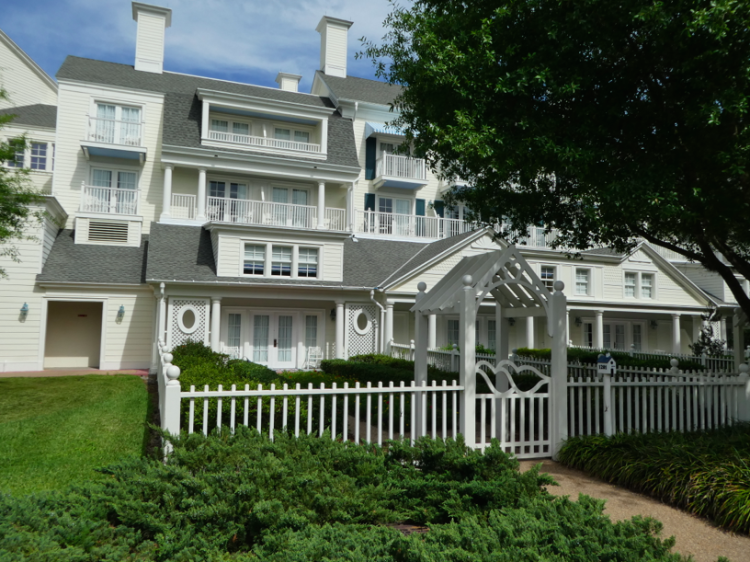 A nostalgic nod to turn-of-the-century coastal city architecture, Disney’s BoardWalk Inn offers family-friendly pools, playgrounds, and proximity to boardwalk shops and restaurants. BoardWalk Inn Cottage Suites; Photo by BigFamily TMOM, Heidi Gollub. 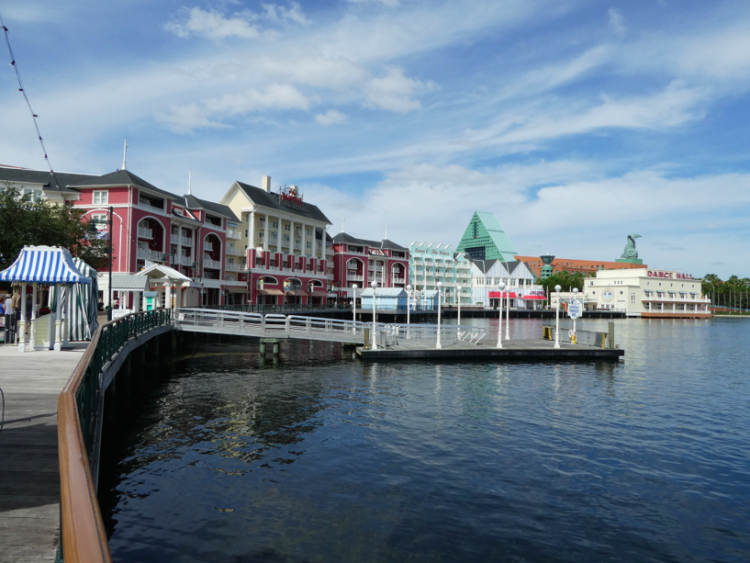 Disney’s BoardWalk Inn & Villas is located along the quarter-mile boardwalk flanking Crescent Lake, just a short walk from Epcot, or a relaxing boat ride to Disney’s Hollywood Studios. Enjoy modern luxuries in vintage style at this quaint resort, and delight your family with food and entertainment reminiscent of turn-of-the-century Atlantic City and Coney Island boardwalks. Disney’s BoardWalk Inn & Villas; Photo by BigFamily TMOM, Heidi Gollub. In true Disney form, there is no shortage of family fun at Disney’s BoardWalk Inn. Guests of all ages can enjoy the carnival-themed pool and clown face waterslide (with a poolside bar, for the adults), playgrounds, fishing, tennis, bike rentals, and arcade. As the sun sets over Crescent Lake, Disney’s BoardWalk comes to life with twinkling lights and entertainers. Whether you’d like a quick snack or a sit-down meal, there are several options located near the hotel. BoardWalk Bakery is available for Quick Service meals, and the neighboring Pizza Window also accepts Disney Dining Plans. This spring, Ample Hills Creamery is slated to open, offering old-fashioned, handcrafted treats. And the popular Flying Fish Café, which is currently closed for renovations, is scheduled to reopen this summer with a brand new look and menu. 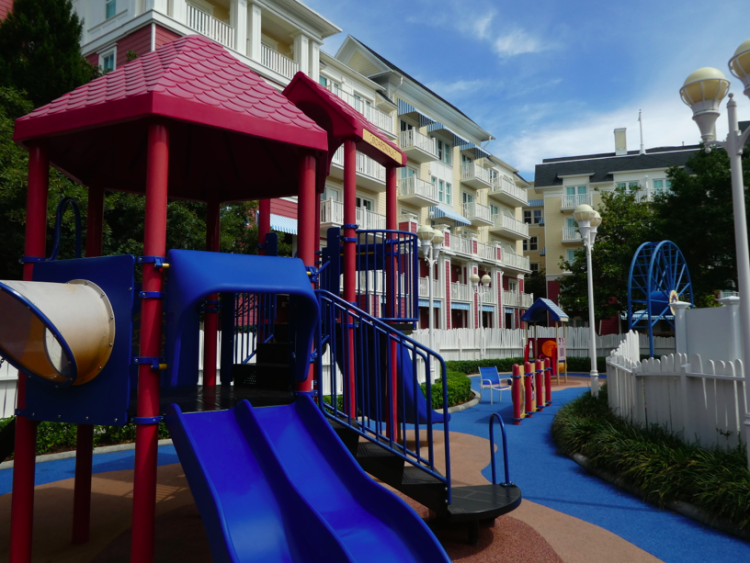 Disney’s BoardWalk Inn Playground; Photo by BigFamily TMOM, Heidi Gollub. Location, location, location! The resort is walking distance from both Epcot’s back entrance and Disney’s Hollywood Studios. You can walk, take a boat, or go by bus – all for free! From Epcot, you can take the Monorail to Magic Kingdom. Bus transportation throughout Walt Disney World Resort is also free for resort guests. For more transportation options, read Tips for Walt Disney World Transportation. Some rooms at the resort offer a view of the Epcot fireworks. When you stay at Disney’s BoardWalk Inn, Disney’s Magical Express bus transportation to and from the airport is included, and complimentary luggage delivery is also available. Submit your flight information when making your resort reservation and you will receive luggage tags in the mail. Attach those tags to your bags before you fly, and Disney will deliver your luggage directly to the BoardWalk Inn, allowing you to bypass the hassle of baggage claim. When you land in Orlando, simply head to Disney’s Magical Express, which will take you to the BoardWalk Inn to be reunited with your bags. Disney Resort guests can make their FastPass+ reservations 60 days before their arrival. 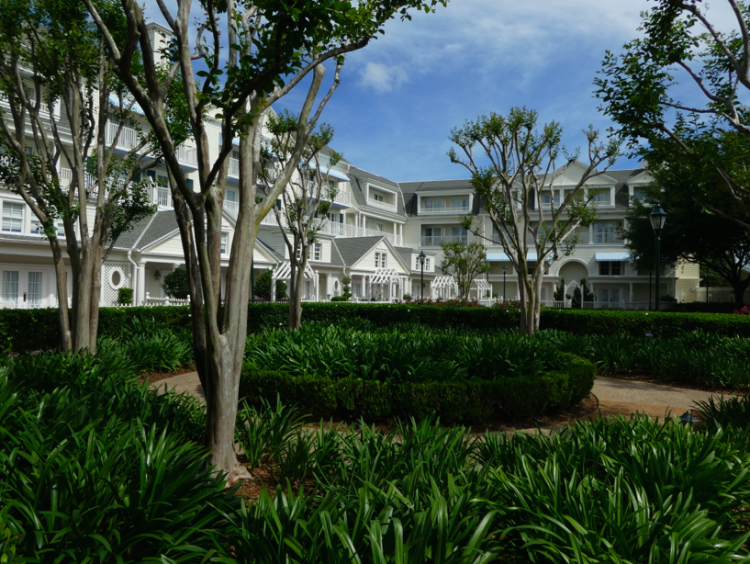 BoardWalk Inn guests enjoy complimentary parking at Walt Disney World theme parks and Resort hotels. Families can take advantage of Extra Magic Hours in the parks, which are only available to guests of Disney Resort hotels. 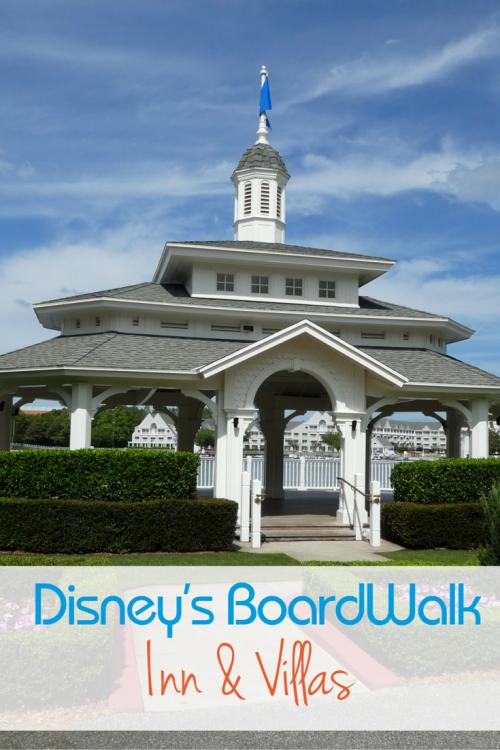 BoardWalk Inn is smaller than other Disney Resorts, which makes it less overwhelming to visit with small children. There are a variety of casual restaurants on the boardwalk, within walking distance of the hotel. There are photo ops around every corner! During a recent visit, I took along my new Panasonic LUMIX ZS60, and enjoyed playing with the bells and whistles (like the 30x zoom lens and the control ring easily adjusting the aperture) while photographing the resort’s lovely landscaping. If you choose to use the complimentary luggage delivery service, it could take up to nine hours for your bags to be delivered from the airport. This service works best if your flight arrives in the morning. Disney Dining Plan is great for older kids, but might feel overpriced if you have a young one who doesn’t eat much. Unfortunately, you can’t pick and choose who gets the Dining Plan. If you choose to buy it, you must purchase the plan for everyone in your party. If you have a large family and occasionally opt to not include a toddler on your hotel room reservation, that won’t fly at a Disney Resort. If a child is not listed on the room reservation, it will be difficult getting them on the Disney Magical Express at the airport and, if the child is age three or older and requires a park ticket, you will not be able to link their ticket to their MagicBand or make their FastPass+ reservations if they are not listed as staying in your room. Bus transportation to Disney Springs can take 45 minutes (or longer, if you have to first wait for a bus to arrive). If you’d prefer to stay closer to Disney Springs, consider Wyndham Lake Buena Vista, which is right across the street from the shopping and dining district. 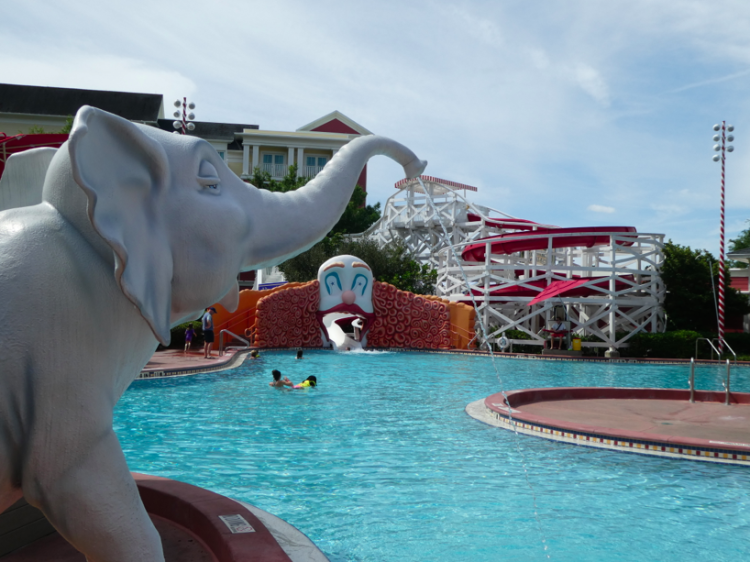 This hotel also offers an awesome Oasis Aquatic Playground and a Disney Character Breakfast three days a week, complete with a buffet and photo opportunities with two of the Disney “Fab Five” characters. 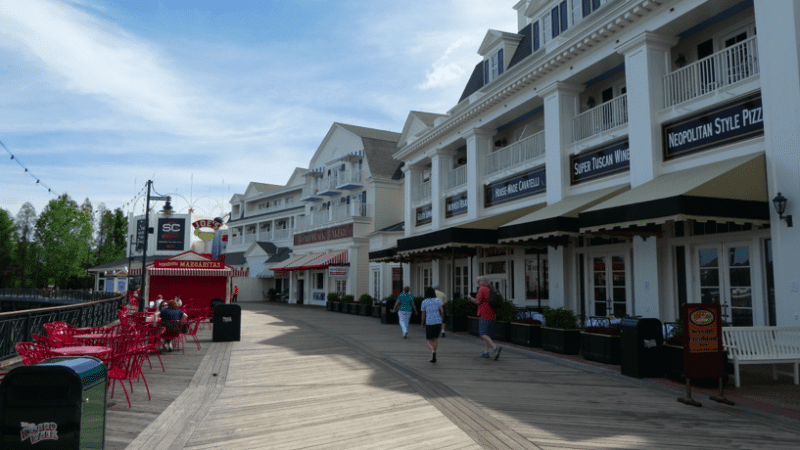 Disney’s BoardWalk; Photo by BigFamily TMOM, Heidi Gollub. The BoardWalk Inn’s villas are a great option if you’d like a little more space, and a kitchenette! Be sure to check Vacatia, to save on a villa stay. Vacatia is a new website that helps families rent the perfect resort residence for their family vacation (similar to HomeAway, but featuring only resort properties, at a discount). You can see floor plans, to check out exactly how many rooms (and bathrooms) each available villa has, as well as a full list of its amenities. 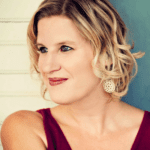 Be sure to read Extended Vacation Rental Strategies with Kids, to help plan your visit. You may also be interested in 8 Ways to Save at Disney World Resorts!